Toronto, ON – The Ontario Hockey League today announced the Top OHL Performers of the Month for regular season games played in December 2016, including Peterborough Petes forward Zach Gallant, Kingston Frontenacs blueliner Stephen Desrocher, Guelph Storm rookie Ryan Merkley and Windsor Spitfires goaltender Michael DiPietro. 2017 NHL Draft prospect Zach Gallant of the Peterborough Petes is the OHL Player of the Month for December after collecting seven goals, eight assists and 15 points over 10 contests along with a plus/minus rating of plus-13. 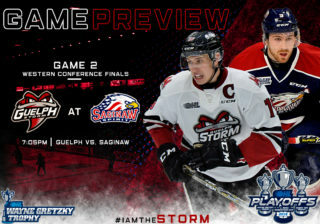 Gallant was also 56 percent in the faceoff circle to help the Petes to a perfect 10-0-0-0 month of December as they climbed to second place in the East Division. The 6-foot-1, 184Ib. centre had points in eight games including five multi-point outings. 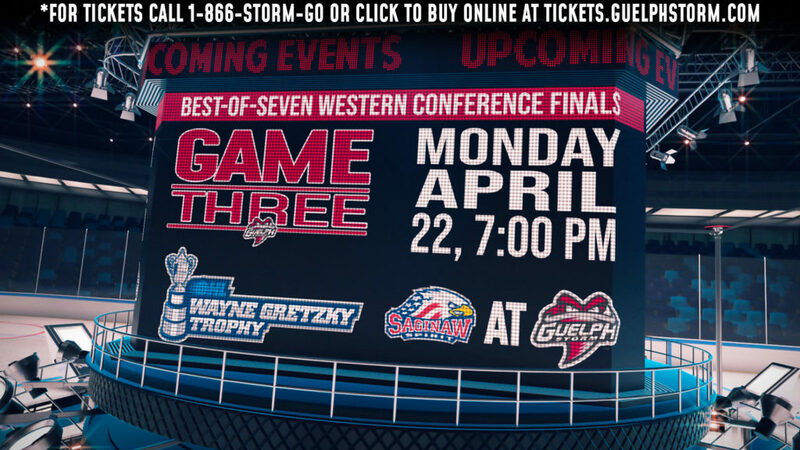 Gallant earned first star honours on four separate occasions, doing so on December 3rd when he had a goal and an assist in a 5-2 win over the visiting Guelph Storm. His two goals and an assist on December 11th led the Petes over the Ottawa 67’s 6-2 on the road. 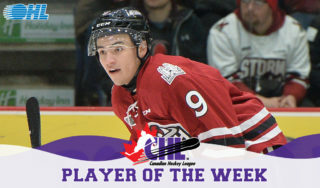 Gallant was named first star once again on December 15th when had a goal and an assist to help the Petes defeat the London Knights 3-1 on Sportsnet. Gallant rounded out his first star selections on December 29th with two goals and an assist in a 7-5 win over visiting Ottawa. A 17-year-old native of Oakville, Ont., Gallant is currently in his sophomore season with the Petes after being the club’s first round (5th overall) pick in the 2015 OHL Priority Selection. He’s currently tied for fifth in team scoring with 12 goals, 17 assists and 29 points over 36 games to go with a plus/minus rating of plus-9 and a 59.4 percent success rate in the faceoff circle. Toronto Maple Leafs prospect Stephen Desrocher of the Kingston Frontenacs has been named the OHL Defenceman of the Month for December. Desrocher led all defencemen with 15 points including two goals and 13 assists over 10 games as the Frontenacs played to a 5-1-4-0 record. The 6-foot-4, 206Ib. rearguard recorded points in all 10 of his December contests, registering four multi-point outputs. Desrocher earned first star honours four times as he helped the Fronts defeat the visiting Kitchener Rangers with a goal and an assist on December 2nd. A night later he pitched in with two assists in a 3-2 shootout win in Hamilton. Desrocher recorded a pair of helpers to earn first star recognition in a 3-2 home ice win over Oshawa on December 17th. 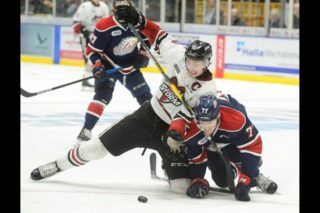 He rounded out his first star performances on December 30th with three assists in a 4-3 overtime loss to Peterborough. A 20-year-old native of Toronto, Ont., Desrocher is in his fourth OHL season and second with the Frontenacs after spending parts of three seasons with the Oshawa Generals where he won an OHL title and Mastercard Memorial Cup championship in 2014-15. He leads Kingston defencemen in scoring with five goals, 20 assists and 25 points over 33 contests and has recorded 13 of his 25 points on the power play. He was Toronto’s sixth round (155th overall) pick in the 2015 NHL Draft. 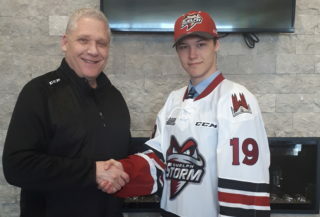 For the second time this season, 2016 OHL Priority Selection first overall pick Ryan Merkley of the Guelph Storm is the OHL Rookie of the Month. Merkley led all rookies with 13 points including four goals and nine assists over 10 games. His December included the first two multi-goal games of his OHL career including a pair on December 7th in a 5-4 road loss against the Sarnia Sting. Merkley’s overtime winner on December 11th was his second of the game and along with an assist, he recorded three points to earn first star recognition in a 4-3 win over the Kingston Frontenacs. The rookie had a three assist effort, setting up the overtime winner on December 28th when the Storm defeated the visiting Sarnia Sting 4-3. A 16-year-old native of Mississauga, Ont., Merkley leads all OHL rookies with 28 points including six goals and 22 assists over 30 games. He is third in Storm scoring this season after being the club’s first round (1st overall) pick this past April. He will be eligible for the 2018 NHL Draft. 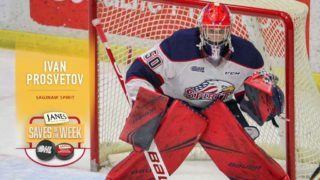 2017 NHL Draft prospect Michael DiPietro of the Windsor Spitfires is the Vaughn OHL Goaltender of the Month for December. DiPietro played to a 6-2-0-0 record with a 1.48 goals-against-average, a .940 save percentage and three shutouts over his eight December starts. He started the month with a 36-save performance on December 3rd as the Spitfires claimed a 2-1 win over the Flint Firebirds. His month was headlined by a string of three straight road shutouts from December 8-11, earning him Vaughn CHL Goaltender of the Week honours as he blanked the Barrie Colts, Sudbury Wolves and North Bay Battalion in succession. DiPietro put together a shutout streak that spanned parts of five games for an overall length of 209:23. A 17-year-old native of Amherstburg, Ont., DiPietro comes off a tremendous rookie season in the OHL, one that earned him the F.W. Dinty Moore Trophy with a 2.45 goals-against-average. This season, DiPietro has played to a 16-5-4-0 record with a 2.21 goals-against-average, .918 save percentage and four shutouts over 26 games. He was Windsor’s second round (23rd overall) pick in the 2015 OHL Priority Selection. DiPietro will represent Team Orr in the upcoming 2017 Sherwin-Williams CHL/NHL Top Prospects Game in Quebec City on January 30th.